Today we bring you an interview with Dan Richardson who placed 4th in the Open Division in the last Adonis Index Contest. This is not the first competition Dan placed in. Right now he has three contest under his belt. Here is a compilation of Dan's before pictures from his second contest. These are the after pictures from Dan's second contest. This is basically how you do this. You lose fat and tighten up and place in the transformation contest and then you more muscles, reshape your body and compete in the Open category. 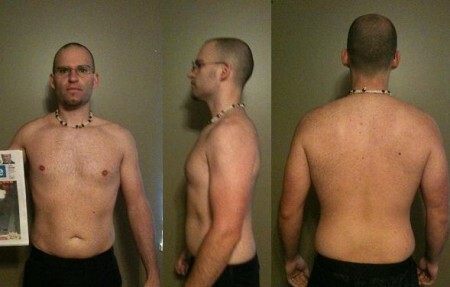 In the last contest he went from 172 pounds to 141 pounds. He cut as hard has as he could. And over the range of 16 months he has lost 100 pounds. No, I’m not kidding, he really did lose 100 pounds. It’s pretty hard to imagine how much effort he had to put in to constantly stay in a deficit for more than a year. Dan told us that the last time he may have overdone it a bit and pushed himself too hard. If you happen to listen to VI from time to time you know that this is somewhat similar to the experience that the Venus Index winner Alisha had. This is why Dan decided to loosen up a bit and not go too strict to avoid any rebounds after this contest. Dan thought that once he arrived at his desired body weight goal he would be able to stop cutting and go back to eating more, almost like he did before. There are two things going on you need to understand and they are connected to each other. First of all, even maintaining your look requires effort. Just like you have to work out to prevent your muscles from atrophying, you also have to do something similar with your diet. If you want to keep the weight off once you lose it, you just can’t go back to overeating. That’s a fundamental basic rule of how this works. Once you lose fat and start eating more than you burn, well the difference gets stored as fat. However, this doesn’t mean you have to diet all the time, when you are satisfied with your bodyfat percentage, you can just enjoy the maintenance. This brings us to a next thing and that is “The Swing of the Pendulum”. A pendulum can be used as an analogy to weight loss and weight gain. As you can imagine, you can’t really eat exactly at maintenance even if you wanted, because you don’t know the EXACT number of calories your body burns every day. More accurately you could say that you are always kind of either losing or gaining fat, but it’s in an almost unnoticeable way. If we use the pendulum analogy, it’s always swinging in some direction, even if it’s just a little. Finding how to eat to keep the pendulum swinging as little as possible is what eating at maintenance really is. Social eating events like christmas, thanksgiving, weddings, birthday parties or Friday nights out with friends are also part of your diet and you need to learn to balance those days with other less indulgent ones. On those sort of events you will most likely eat more than your calorie expenditure that day and you will have to make up for that either upfront, after or both. That will also be a part of maintenance. As you can see, even maintenance requires some effort, not as much as a full cut, but it’s still work on your part. If you are like Dan and have “gorging urges” from time to time, you will have to find out how to manage them to keep your six pack. Dan tried a lot of things. For example he wanted to improve his commitment and made a deal with his friend that each week he didn’t drop an inch on his waist, he would give him 100 bucks. And it worked, he really lost all the inches he wanted. However, at the end he rebounded and put on 10 pounds. This was a big issue for him. He could gorge himself back to where he were before if he allowed it. Like he said, he can’t eat whatever he wants whenever he wants like some guys recommend, because there is no stopping him. Even 10 000 calories is not a ceiling for him. This is why he discovered that he needs to count calories and weigh himself regularly, otherwise he will gain pounds of fat and spend the next month cutting back. He tried to stop weighing himself like some previous contestants advised, but that didn’t work for him, because an inch on his waist doesn’t seem like a big number, but 5 pounds does. Pounds on the scale held him more accountable and gave him a range that he knows he needs to stay in. Being lean holds a new set of challenges, it’s not like you lose all the fat and all of life’s problems disappear. While a lot of problems get solved, there will be new challenges you need to focus on. For Dan it was finding new eating habits. He also realized that he needs to count calories, because he would easily eat his way up to 10 000 if left totally unchecked all the time. He set a new pattern that is somewhat similar to other contestants, restricting during the week and saving the calories for the weekends. He found out that there is a totally different tension between his diet and himself. Being 100 pounds heavier he would eat whenever he wanted, whatever he wanted and how much he wanted, not restricting himself at all. This tension meant a completely new approach. For example he stopped doing 24-hour fasts twice a week and started doing 16-hour fasts every day. When you are lean, you have to stay in a smaller deficit for shorter periods of time, because if you don’t you may end up overeating afterwards. The last thing he changed was cardio. He decided to put most of the energy on the resistance training and added just a few sessions of steady cardio a week 30 minutes each. If you’re like Dan you may want be careful with the cardio, because if you overdo it, your hunger will kick in and you will end up eating what you just burned. Don’t worry about skinny comments. After a while people will get used to your knew look. Focus on building muscles. Some guys don’t weigh at all to avoid obsession with weight numbers, but if the weight holds you accountable then by all means weigh yourself every day. The support in the community is huge, he once tried to unplug, but that was a mistake that set him up for failure for several weeks. In the community you can find guys that are further along the way than you and will hold you accountable. Men always try to get bigger and be more superior, however what really matters is the shape, not the weight. Just because you wear small or medium shirts doesn’t mean you are less of a man.